Luton Town managing director Gary Sweet said promotion from the Conference Premier feels like the end of an unjustified jail sentence. 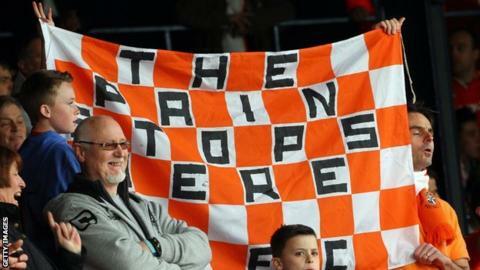 The Hatters were relegated five years ago after a 30-point deduction. "It feels like we've been wrongfully imprisoned," Sweet told BBC Three Counties Radio. "We've done the time and come out and this is our day of being released. And that's not just for me and people at the club, it's the supporters too." It has taken five years and five different managers for the Hatters to return to League Two, with boss John Still taking his third club out of non-league football, following successes with Maidstone in 1989 and Dagenham & Redbridge in 2007. Resentment has remained at Kenilworth Road about the manner of their demise, with the club deducted 40 points over two seasons. In 2007-08 they were docked 10 points for being in administration, though the club would have been relegated from League One that season regardless. And in 2008-09, the Football League deducted a further 20 points for the Hatters' continued insolvency problems, and the Football Association removed 10 points following an investigation into illegal payments to agents. Sweet was part of the Luton 2020 consortium that rescued the club from financial insecurity in 2008, and he will now focus on taking Luton up the leagues. "This is a new job now. It starts again," he said. "We're going to be a bit like an uncoiled spring. Once we're out of this difficult promotion, there are no bounds to what we can achieve. "That doesn't mean to say that we're going to do it quickly. We have to do it in a stable manner, because that's what our business culture is based upon. "The stability in the background enables John to manage the team the way he likes."